GRITIT looks after numerous housing associations across the UK. 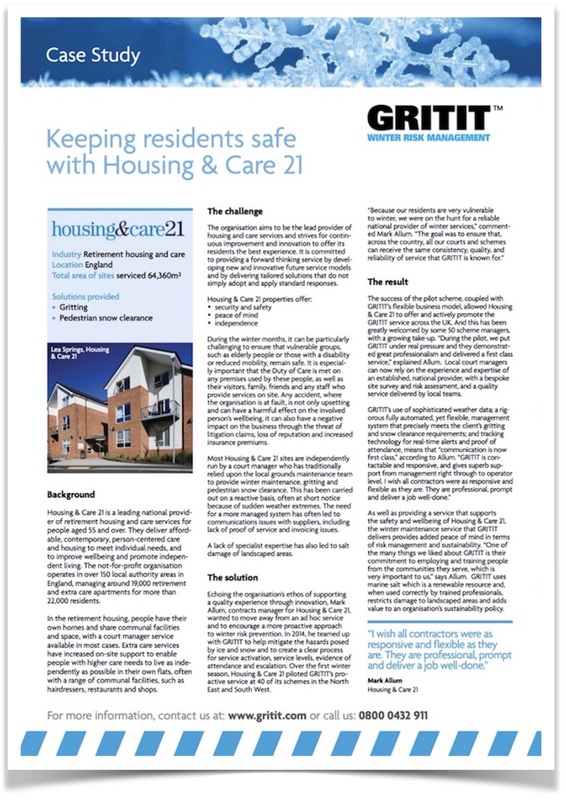 GRITIT's reporting, experience, account management, high service levels, ease of management for court managers and scheme managers, care and attention, consistent local teams and fantastic levels of reporting are just some of the reasons housing associations look to GRITIT to solve their issues. Many, if not all housing sites have vulnerable residents - i.e. elderly, special needs, disabilities etc. and GRITIT understands the level of care that is needed to support them in providing a safe environment for the residents in winter.We take care and go the extra mile to look after the residents. Ie noise and light pollution at night - we instruct our operatives to turn off the vehicle when gritting pedestrian areas to minimize vehicle idling noise which might upset the residents, and turn beacons off when travelling around the site to stop flashing lights coming through the residents windows. And of course, GRITIT is proud to provide local employment and training for the folks working on our housing association sites such as Housing&Care21 and Together Housing. GRITIT helps you do your job better. As a Housing Association Court Manager or Scheme Manager of a housing association, GRITIT understands that you feel incredible time pressure. GRITIT understands what's important to housing association court managers, housing association scheme managers and housing association residents. Team continuity for example, we know you like to know who you're working with and the residents do too. Years of experience across dozens of housing associations means we know what you expect, and we'll deliver. This is the benefit of working with a team who have done it before. Knowledge and experience. As a housing association court manager or housing association scheme manager, you want to know that your provider is always available on the end of the phone to discuss things. And as a housing association resident, having that personal relationship with the guys and gals who look after the place gives this extra edge of reassurance to residents, especially the infirm or elderly. GRITIT prides itself on being accessible; meeting up as and when requested with housing association court managers, housing association scheme managers and housing association residents. We pride ourselves on doing a GREAT job, not what a job 'that'll do'. Going the extra mile is standard with GRITIT; test us out and you'll see. We're known for our high level of service across the entire portfolio, giving care and attention to priority areas and landscaped areas. GRITIT makes court manager and scheme manager jobs easier! Court managers and scheme managers: working with GRITIT is easy! Court manager and scheme managers, we've got your back. GRITIT - the one stop shop for facility managers and site managers. GRITIT started off as a company ploughing the snow away from a few sites in England.